Dallas Cowboys quarterback Tony Romo (9) walks off the field as photographers capture images after the game against the Green Bay Packers at AT&T Stadium. 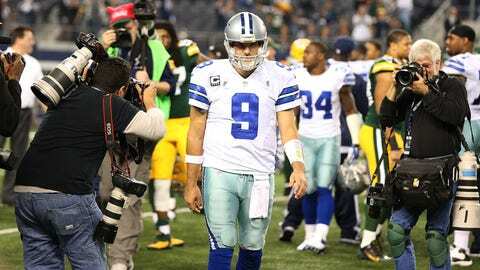 The Packers beat the Cowboys 37-36. Once again, looking at the offense for the Green Bay game is going to be similar to the Chicago contest in many respects. Lots of good things were done here, but the current circumstances of the entire team require for near perfection from the offense to balance out the defensive futility. This happens around the league and through NFL history. One side of the ball is significantly better than the other and is asked to shoulder way more of the burden. Sometimes, it has even been resulted in a Super Bowl title, but that requires 2 things: 1) the inferior side of the ball to not be so inferior that they are asking the superior side to make up miles and miles of space. 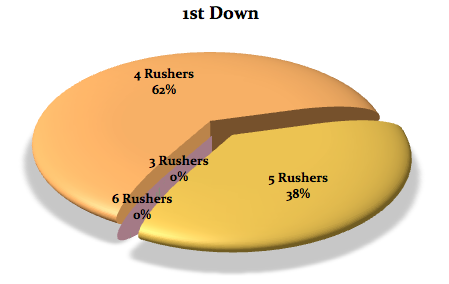 and 2) the superior side of the ball is really good at playing near perfect football. The 2013 Dallas Cowboys do not seem set up for that task on either side, as the defense is now at or below all-time historic lows and is showing no signs of a recovery. Meanwhile, the offense, despite overall improvement as this year is going on and demonstrating versatility and some power to their overall punch is unable to play perfectly enough to bring home games where they are not receiving much help. Now, we should certainly separate the New Orleans and Chicago blowouts from games like Sunday against a Green Bay team that had no Aaron Rodgers, Randall Cobb, or Jermichael Finley. They weren’t the Green Bay JV, but with a 23 point halftime lead, there is simply no justification for that game not being in the win column. We can rationalize and sympathize all we want and still know that this one is not able to be explained away. Still, there wouldn’t have been enough possessions for the Packers to mount their inspired comeback if coach Jason Garrett and Bill Callahan, his play-calling offensive coordinator, had given the ball more to Murray. “Oh, my God,” nose tackle Ryan Pickett said. “It’s the best zone scheme in the league. They say it’s old, the Wisconsin scheme. Dallas (7-7) ran Murray 18 times, and he averaged 7.4 in gaining 134 yards. By comparison, the Cowboys had 51 dropbacks, a 26.1% rushing rate that was much lower than their low 13-game mark of 35.9%. Granted, Green Bay’s defense was there to be taken early. 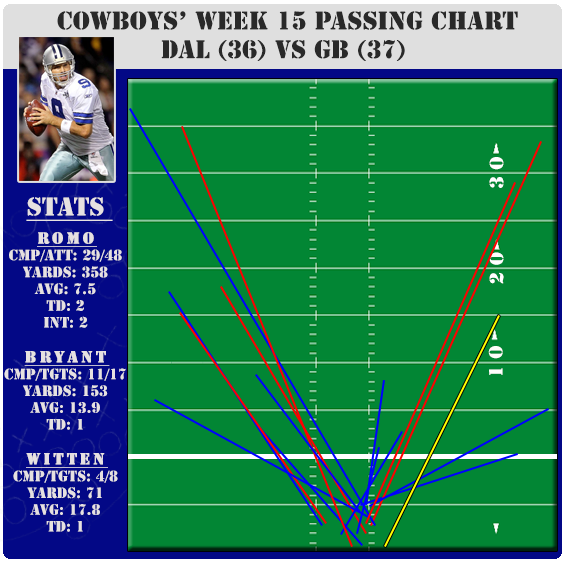 With no pass rush whatsoever, you could forgive Garrett/Callahan for passing early to get the lead because Tony Romo had all day. But not to run a gifted back such as Murray, and thereby allow his effective offensive line to settle accounts and protect the miserable defense, bordered on criminal in the NFL. Wow. It really appears the Packers are far more impressed with the Cowboys running game than the Cowboys were. Now, we shouldn’t take opinions from emotional football players in a winning locker-room who might be subject to hyperbole and dramatic effect. But, what if they are right? What if Ryan Pickett is serious when he say that the only thing that has stopped the Cowboys offense in the last month is the Cowboys lack of taking their car out of the garage? What if the coaching staff is going with dated material from an era when the Cowboys could not run the ball to save their life and suddenly, that is no longer accurate? So, I started trying to apply numbers to check their opinions with math. Were the Cowboys running the ball really well and many of us (at least me) too bothered by 2010-2012 that we are not seeing slow growth – almost like your child growing and you don’t notice but grandma sees it better because she sees the child less. I went back to Thanksgiving. Then, I went all the way back to the day that DeMarco Murray rejoined the team in time for the Minnesota game on November 3. So, what did I find? Well, from the start of November until this Green Bay game, where do you think the Cowboys rank in yards per attempt? How about #1 in the NFL? 32nd in the league. How Jason Garrett is that? We realize that more carries will lower the average – most likely – but, come on. This is crazy. You do something well and you still don’t care to do it. So, I have heard from several people who look at this and are not convinced of anything. 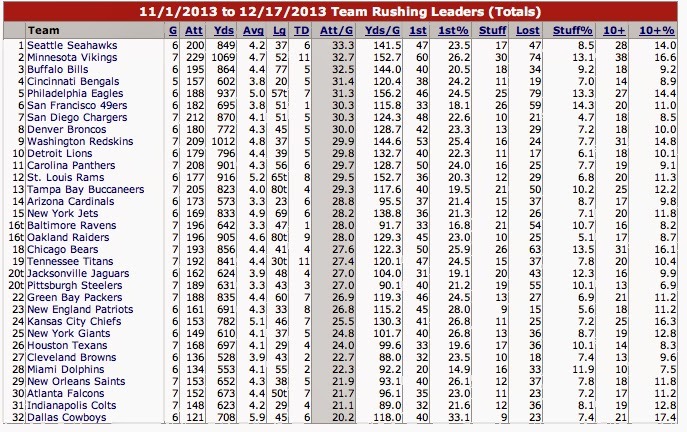 Look at the teams that are running well – those aren’t the best teams in the league. And you are right. 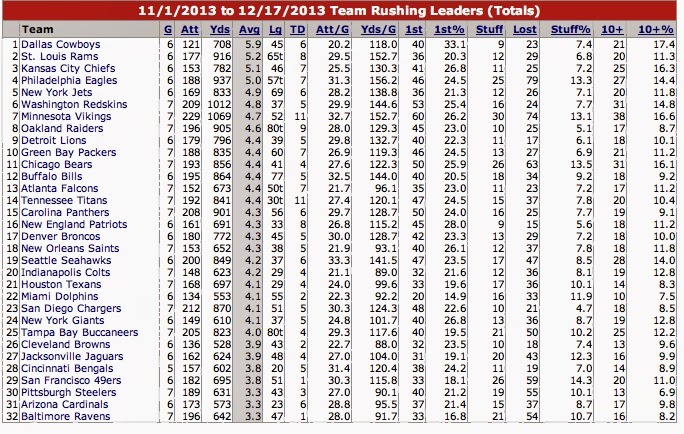 I am not here to argue that rushing yards per game means that you win a lot. This is merely a discussion about how the Cowboys can win more games by using their common sense and figuring out how to further assist a poor defense by keeping them off the field. I am here to report that the idea the Cowboys don’t run because they can’t run is incorrect information if we update results. And it mirrors what we have seen below in our tracking of personnel groups. It is not aided by garbage time or 3rd and 15 draws. 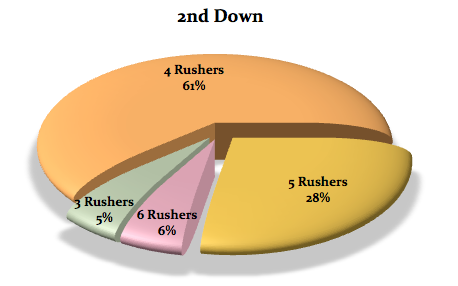 The Cowboys are lining up and running the ball with great success since DeMarco has come back. Starting with the Minnesota game, we have seen the same OL for each game, too. Brian Waters played his last game in Detroit and since then, it has been LT Tyron Smith, LG Ron Leary, C Travis Frederick, RG Mackenzy Bernadeau, and RT Doug Free. They are inconsistent in pass protection (aside from Smith), but as a group they really look like they have figured out the zone blocking scheme with fantastic effectiveness. And do not underestimate Frederick, who is a rookie, but comes from Wisconsin where this is all they do when running the ball. He is teaching the course and playing very well – but he is not alone. Also, it is exactly what this team has needed to shorten the game with a defense that you cannot put back on the field. Which is why we are continuously confused with the play selection where they seem to be applying dated material that argues they simply cannot run the ball and the clock. Do they know this? The team is not inept at running anymore. At least in this arbitrary sample size that is growing each week. So, this is the first play of the final drive. You might recognize the personnel grouping and the formation because it is the same exact look as the fateful 2nd and 6 that was 4 plays later. This is a play that has been looked at and universally agreed that while risky, if Romo puts a bit more on this pass, Dez has Shields beaten and this is 80-yard Touchdown kill shot. Not a bad idea at all, just under thrown which is still not a bad option because Dez usually wins all jump balls. But, I wanted you to look at the formation and look at James Hanna get over to Clay Matthews who is over Tyron Smith. Also, watch the line and Murray zone run right. This is important to see how Clay is sitting on the run here and runs right into Hanna. He is going to run Murray down from the back side. Look at everything selling run right and Romo kept and played his 1 on 1 game with Dez deep. This looks familiar right? So, we have looked at this from every angle. Cleary, the first thing here is to run the clock and don’t throw at all. I cannot really make a case against that a day later. Green Bay again shows 11 up close to the line. The Cowboys have a prepackaged play which is supposed to be a zone right to Murray which will, at worst, cause Green Bay to use its final timeout and at best get a 1st Down and kill the game. Instead, because of no safeties deep, Romo switches to a 1 on 1 battle to Miles Austin (remember where Dez was?) on the backside. Why? Because he assumed the run wasn’t going anywhere and subconsciously knew what happens if they punt with 2:00 to go against a Packers offense that had 4 touchdowns on 4 possessions in that half. I am not saying he was right to make this decision, but if you look at it from that perspective, it at least is understandable logic. So, Romo opts to a pass on a play where nobody but Austin and Romo know it is a pass, and as Romo is supposed to be throwing the ball, Austin’s slow release opens on the slant just as an unblocked Clay Matthews arrives on Romo’s lap. Romo amazingly eludes him, but, now the play is off schedule and Romo regathers and throws late and behind Austin. This brings the speedy Sam Shields back into the play and before you can blink, the ball has been turned over at the worst possible minute. The real issue is the throw was poor and missed where you simply cannot miss. But, one last point. Look how Romo tells Escobar to stay right just before the snap (Escobar has motion as an option if Romo wants it, but Romo knows to motion Escobar will tell the Packers that the run right is off). Then, look how Clay Matthews – just fooled by this exact look 4 plays ago – decided not to worry about Murray and go straight for Romo. How Romo made him miss is magical, but look how quickly the Packers recover. I said yesterday that maybe he should have run, but if he does, he isn’t going anywhere. A better throw is a Touchdown. But, that doesn’t mean anything now. 17 targets. That is a lot. More of Garrett trying to keep the Cowboys balanced and sound, but that clearly got out of hand with 2:00 to go in the half. SUMMARY: So, here we are again. The offense played very well and still lost. The numbers are out there where teams should never score 36 and lose, but now Dallas has done it twice. They are playing better, but not close to perfect and not managing the clock worth a hoot. But, they are getting a solid year from their offensive line and are now able to line up and run the football. 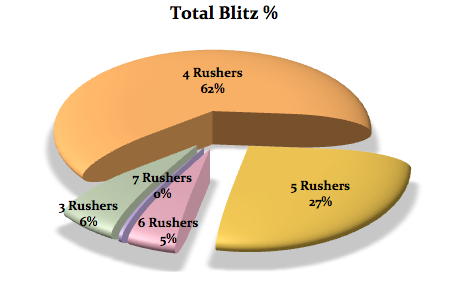 They have not run this well since 2009 and they need to figure this out quickly to deal with Jim Haslett and his blitzes that terrorize the Cowboys offense over the years. Meanwhile, Dez and the weapons found all sorts of opportunities down the field against a poor Green Bay defense and rolled up stats despite facing a ton of blitzes. That won’t change. 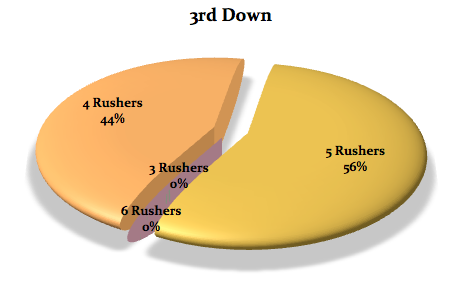 What must change is the continued poor 3rd Down play. The Cowboys have converted the 32nd most 3rd Downs this season (56) and by far the fewest on the road (23). This ability may decide their season which amazingly, is still completely salvageable. Just win. And to win, the offense is going to have to do the heavy lifting, because Bob Lilly and Doomsday is not walking through that door.